This page sets out the main online and offline resources for searching Irish civil registration indexes, and provides a basic introduction to each of them. As you will see, there is a lot of overlap in the records available, but there is also some exclusivity. Some suppliers provide free access; others charge. All in all, it is currently a rather muddled picture. A clearer path may become available in Summer 2018. The Public Record Office of Northern Ireland has a state of the art home in Belfast. The so-called 'enhanced' version of the Irish civil registration indexes is available at IrishGenealogy.ie, a state-run site providing access to the General Register Office of Ireland's database. It holds island-wide registrations up to and including 1921, and registrations for the Republic of Ireland since 1922. Birth records over 100 years old. Each index entry is linked to an image of the respective register page. Marriage records over 75 years old. Index only from 1845/1864 to 1869. From 1870 onwards, each entry is linked to an image of the respective register page. Death records over 50 years old. Index-only from 1864 to 1877. From 1878 onwards, each index entry is linked to an image of the respective register page. 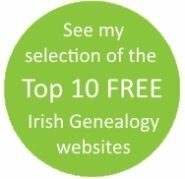 See Tips for searching IrishGenealogy.ie. 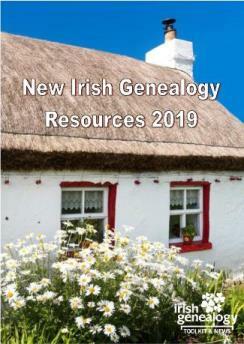 It is hoped that Spring 2019 will see the arrival of a final tranche of register images linked to the indexed entries on IrishGenealogy.ie. In a positive way, this will narrow down database options for most researchers, with the alternative databases only needing to come into play when more recent births, marriages and deaths are being researched, or when IrishGenealogy's index search facility fails to find the right record. Birth records over 100 years old. Basic details are provided free. You can choose to pay to view (on screen) an enhanced transcription or an image of the register entry. Marriage records over 75 years old. Basic details are provided free. You can choose to pay to view (on screen) an enhanced transcription or an image of the register entry. Death records over 50 years old. Basic details are provided free. You can choose to pay to view (on screen) an enhanced transcription or an image of the register entry. Costs are very reasonable; you have to purchase credits in advance. Click the link above to find out more about the online GENI database, or see Toolkit's Northern Ireland civil registration records page for more information. The Irish Civil Registration Indexes on FamilySearch is a reliable genealogy resource, despite its limitations. The most important of these are the 'cut off' date of end-1921 for records relating to the six counties of Northern Ireland, the absence of the maiden name of the mother in the birth indexes, and a handful of gaps in coverage. Birth Indexes span 1864 to 1958. Marriage Indexes span 1845/1864 to 1958. Death Indexes span 1845 to 1958. There are gaps in birth registration coverage for 1867, 1869, 1880 and 1892-93. There is just one gap in death registration coverage: Quarter 3 of 1894. Ancestry has the same core data as FamilySearch (see above) so the same limitations and gaps apply to this version of the same collection. The advantage of the Ancestry version is that its search engine is, in my opinion, far superior, plus it offers better options for marriages, allowing you to link the bride and groom. The downside is that it is not free. A third version of FamilySearch's same core data is also available, this time on FindMyPast. Like the Ancestry version, it is not free, but it, too, has a neat Marriage Finder facility that can be very helpful and time saving. In March 2018, FindMyPast released new free indexes to the imaged birth and marriage registration entries held on the IrishGenealogy.ie database (see above). These indexes appeared incomplete, carried no explanation of the dates they cover, and there was no index to the death registration images. They were removed from the database without any comment a few months later, after nearly 60 registration districts were found to have been omitted. I imagine these indexes will reappear in due course duly completed and up to standard. If that happens, I'd expect they will become a popular first collection of choice for family historians because FindMyPast's search facility and recognition of name variants is far superior to that of IrishGenealogy.ie. RootsIreland is the online database created by the Irish Family History Foundation's network of heritage centres. 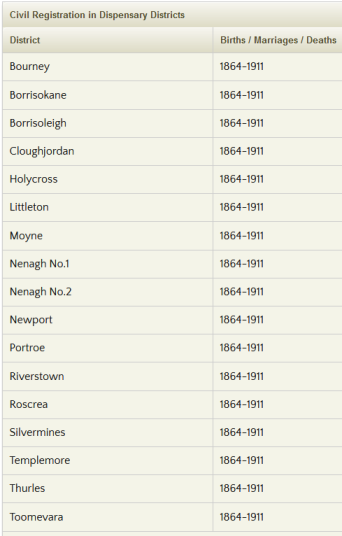 While its coverage of church records stretches across the entire island except south and west Cork, County Kerry and Dublin City, its coverage of civil registration records is not quite as extensive (see below). The civil registration holding of the Tipperary North Heritage Centre, available to search (€£$) at RootsIreland.ie. 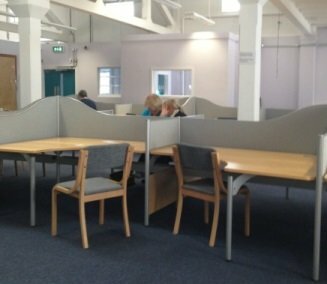 Genealogists at the heritage centres transcribe local civil registration registers as well as church and other records. The not-for-profit IFHC database holds more than 20million records, all of them transcriptions. Access is by subscription - annual, monthly or 24 hours. 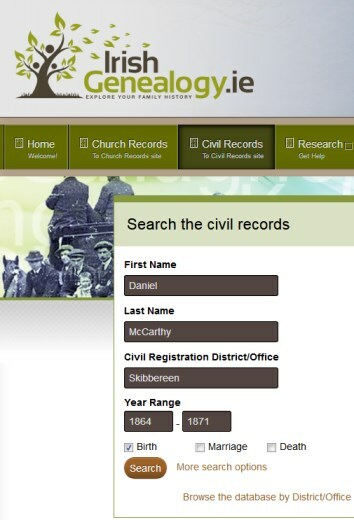 RootsIreland's database of civil registration records is unique in being the only one created from original, locally held registers (ie not the copies held centrally). As such, the RootsIreland database may produce different results to other databases, and even include registrations that were accidentally omitted when the register was manually copied. Additionally, most civil records in the RootsIreland collection run into the 1900s and even 1920s. Civil registration records are not available for all counties. At March 2018, civil records were held for 16 counties: Antrim, Armagh, Cavan, Derry, Donegal, Down, Galway, Kilkenny, Leitrim, Limerick, Mayo, Monaghan, Roscommon, Sligo, Tipperary and Waterford. Geographical coverage for some of these counties is complete. For others it is only partial. Transcription is on-going, however, so it's best to check the sources listing for each county on a regular basis. For births, marriages and deaths that are not included in the online facility, visiting researchers can search on-screen indexes and digitised images in the Public Search Room at GRONI or in the Public Search Room at the Public Record Office of Northern Ireland (PRONI). The two locations hold an identical database. The records cover all life events in the six counties since civil registration began on the island right up to current registrations. Although you can search the civil registration indexes free, you need to purchase credits for an 'enhanced' transcription or to view an image of the register entry. Note: While GRONI's publicly available database is online and is restricted to historical records (the 100-75-50-year rule), the database available to personal visitors at GRONI/PRONI search rooms is unrestricted. It holds index and register images from 1864 for births and deaths and 1845/1864 for marriages, right up to current registrations. You need to book an appointment to visit GRONI's Public Search Room. You do not need an appointment to visit PRONI's Search Room, but you will need a Visitor's Pass. For addresses, see the main Irish civil registration page. More about Northern Ireland civil registration records. Although the GRO's head office is in Roscommon, family historians can make personal visits to the GRO's Research Room in Dublin to study the Irish civil registration indexes to births, marriages and deaths. No appointment is necessary. In my experience, all staff are superbly helpful and will patiently explain how the records are filed and your search options. Bear in mind that you have to carry out your own research and that only the indexes (not the registers) are available for public inspection. They are not computerised. You wade through the heavy index books manually and may have to be patient if another researcher is using the book you want. After studying the indexes and noting the full references for your ancestors' life events, staff will take photocopies of the relevant register entries (allow half an hour per photocopy). An all-day search covering all years and all indexes costs €20 (up to three people can share one all-day search; each can order eight photocopies at €4 each if the index reference is submitted). Alternatively, you can make a €2 search covering a maximum of five years of Irish bmd index books. All photocopies ordered cost €4. If you already know the GRO Index Reference or Group Registration ID of the registration you are searching for, you can also make a personal visit to the Research Room to submit your order for a copy of a register entry. The copy image costs €4 each. Prices correct at January 2019. GRO HQ and Research Room addresses. You can also visit any of the network of civil registration service offices across the Republic of Ireland to obtain 'research photocopies' of birth, marriage and death register entries. Photocopies cost €4. Addresses of Republic of Ireland civil registration offices.